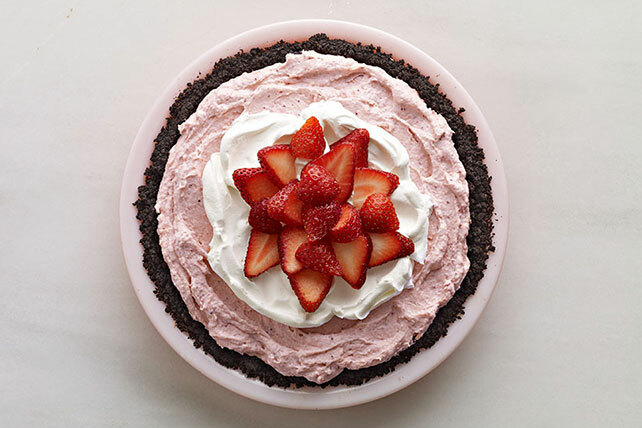 If you like to keep things easy in the summertime, here's your strawberry cream pie—made with frozen berries and pudding and topped with fresh berries. Combine cookie crumbs, 2 Tbsp. sugar and butter; press onto bottom and up side of 9-inch pie plate. Bake 10 min. ; cool. Use pulsing action to process whole strawberries and remaining sugar in food processor just until berries are finely chopped. Add cream cheese; process just until blended. Spoon into large bowl. Add dry pudding mixes; stir 2 min. Gently stir in 1-1/2 cups COOL WHIP; spoon into crust. Refrigerate 2 hours or until firm. Garnish with remaining COOL WHIP and sliced strawberries just before serving. Balance out your food choices during the day so you can enjoy a slice of this creamy pie. Add 1/2 tsp. orange zest to pudding mixture along with the COOL WHIP.